Cheesecake - preferably plain, but I like Cherries on top too! Candy - I like all kinds, but my all time fav is Cadbury's Mini Eggs at Easter. Cedar Point - it's a must for all rollercoaster fans! 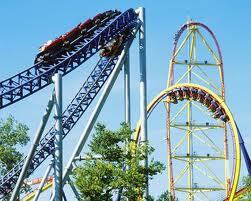 Below is a pic of the Millennium Force, Mantis, and Top Thrill Dragster. Millennium Force is definitely my favorite! What is your favorite summer pastime? Are you a rollercoaster enthusiast? Do you have a favorite park?